Here's a couple of products with similarities. 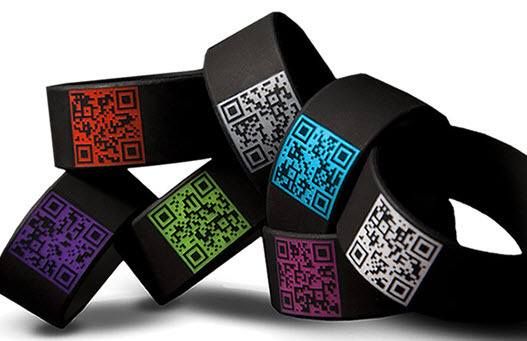 Both seek to merge online with offline connections to create a visually appealing product; in this case the combination of a snazzy bracelet with QR Codes. 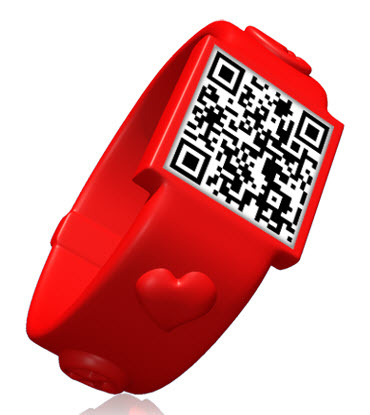 QRLiving connects you online through a wearable QR code and does so automatically; not a word needs to be uttered by either party. Whether this idea will kill the art of conversation stone dead is a moot point. The downside of this adornment is that it requires the user to sign up to yet another network, rather than building on existing social profiles. I am also not that keen on the rubbable symbols that adorn the side of each wrist band but maybe these are designed to appeal to a much younger market. By comparison, Skanz, while linking together QR codes with mobile technology, social media and fashion allows the wearer to make full use of Facebook, Twitter, LinkedIn, Google+ social profiles. As they put it "wearing the web". They are also cleverer than their opposition, encouraging prospects to sign up as product Ambassadors. The use of two dimensional codes is growing and QR Codes are being used by people in greater numbers. A recent study by Forrester Research found that 5% of adults use 2D codes compared to 1% the previous year. Forrester also found that too few eBusiness professionals use best practices to offer consumers good experiences once they've scanned a bar code. Maybe part of that "good experience" could be to give away a free QR Code bracelet?